All-Ireland Qualifiers – Well done to Noel & the Leitrim team who had a great win over Louth in the Qualifiers, they now play Monaghan on Sat. 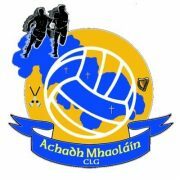 30th June at 2.30pm in Pairc Sean MacDiarmada. Division 3 – Hard luck to the Junior team who were defeated by Glenfarne/Kiltyclogher last weekend. Score: Glenfarne/Kiltyclogher 7-20 Aughawillan 3-7. They now play Aughavas on Friday 29th June at 8.30pm in Aughawillan. Underage – St. Brigid’s u12 team are currently competing in the Cross-County League Competition and were defeated by Southern Gaels in Athlone last week. Score: St Brigid’s 3-6 Southern Gaels 3-10. Next fixture: Wolfe Tones v St Brigid’s, Thursday 28th June at 7.30pm in Devine Park, Mostrim. Club Lotto – Next drawn in Shortt’s Bar on Wed. June 27th. New Jackpot €2,800. Comhghairdeas – Congratulations to Niall Bierne & Brona Wynn who got married recently. We wish them many happy & healthy years together. Dublin-Leitrim Aughawillan Cycle – A Presentation evening will be held, to bring the cycle to a close and to acknowledge the hard work put in by all involved over the past couple of months, on Saturday 30th June in Aughawillan Clubrooms. The presentation will begin at 9pm and all family, friends and supporters are welcome! We’d like to extend a huge thank all our corporate sponsors, who are listed below, as well as the hundred of individuals who contributed to the cyclists through Church Gate & Shop Collections, Pizza Nights, Whist Drives, Table Quizzes, Dublin-Aughawillan Night Out or through personal or anonymous donations. Aughawillan Whist Committee, Aviva, Ballinamore Agri Stores, Ballinamore Credit Union, Ballytherm Ltd, Bank of Ireland, Bawnboy Motors, Beam Vacuum Systems, Bourke Sean GP, Brady’s of Arva, Carrick Medical Centre, Casey Accountants Carrick-on-Shannon, Cathal McBrien Electrical, CCS, Central Motors Mohill, Chemifloc, Classmount, Clinton Park Stables NYC, Commercial Hotel, Conwell Contracts, Cunniffes BC, Doyle Pension Mgt, DPS, Eaton Neary Accountants, Ed Woods, EMF Engineering, Farry F & E, Fingal Pest Control, Fresh Today Ballinamore, Garadice Builders NYC, Gilheany & Co- Accountants, Gorbys Newtowngore Inn, Gorbys PO, Irish Life, Jetwash International, KBG Accountants, Kiernan Farms Aughafad, Lyric Ireland, M&C Financial Services, Martin Insurance Brokers, Martin Reilly Tool Hire, Martin’s Bus Hire Corratillan, McGovern Christy Agri-Services, McGovern Transport Bawnboy, McGrath Bearings, McManus Pharmacy, Merenda Ltd, Moloney & Farrell Accountants, Morans Bicycle Shop Drumshanbo, Mullingar Electrical, Multi-Tech, Playwright NYC, Polyfab Plastics, PWS Signs, Pyramid Bookmakers, QMT Contracts, Quinn Building Products, QuinnBet, Reynold’s Topline Mohill, Rory Dolans NYC, Rosie O Grady’s NYC, S Brady Engineering, Scollan Butchers, Seamus Clarke’s Bar NYC, Smith Monumental, Smyths Pub Ballinamore, SuperValu Ballinamore, Terra Watch, Tesco Ballinamore, Tommy Cassidy SS, Traynor Environmental, TW Johnston Agri Contractors, Ulster Bank Ballyconnell, Watercare Associates, West Coast Dental Ltd, Wrynn Transport Ballinamore.